- Compliant with VGA specification. 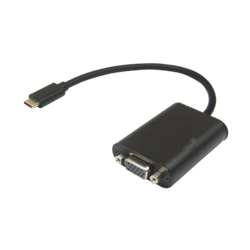 - Compliant with Display Port specification version 1.2 and Embedded Display Port (eDP)specification version 1.3. Storage Temperature: -25~75 deg. Cel. 2. With three output ports, convenient to choose one of them to use at a time as you demand. 3. Support Mini Display Port 1.1a Dual-mode input. Input: USB 2.0; Output: VGA.